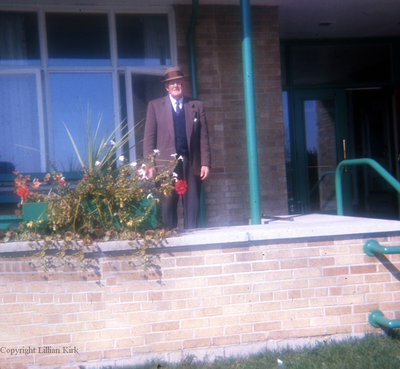 A colour photograph of Bruce Richard Wilson (1883-1975) outside the main entrance of Fairview Lodge. Mr. Wilson was a long-time resident of Whitby. Fairview Lodge was built as the County Home for the Aged to replace the old House of Refuge in 1950/51 and was officially opened by Ontario Premier Leslie M. Frost on December 19, 1951. Kirk, Lillian ; Wilson, Bruce Richard ; Frost, Premier Leslie M.
Bruce Richard Wilson, c.1968, Lillian Kirk. Whitby Archives D2013_011_014.